Aim: To assess the nutritional, immune, micronutrient and health status of antiretroviral naïve HIV-infected children in selected care centres in Mangaung, in the Free State. Method: A cross-sectional descriptive study was undertaken between September 2004 and March 2005 on antiretroviral naïve HIV-infected children in care centres in Mangaung. Results: The study included 37 clinically stable and food secure HIV-infected children. Their median age was 5.35 years (ranging from 1.16 years to 10.17 years). Fifteen children (46%) were underweight, 30 children (77%) were stunted and one child was wasted. The median viral load (n=35) of the group was 117 000 copies/ml, the median CD4+ cell count was 477 cells/mm3 and the median CD4 percentage was 22.5%. Deficient serum levels relative to normal reference values were recorded for glutathione in 91%, albumin in 78%, vitamin A in 63%, vitamin D in 44%, zinc in 38% and vitamin E in 13% of the children. Sixty percent of the children were anaemic and 30% were iron deficient. The most commonly occurring clinical features were lymphadenopathy in 84%, skin rashes in 51%, hepatomegaly in 32%, pallor in 41%, clubbing in 24%, ear infections in 24%, oedema in 22% and mucosal lesions in 16%. Only 8% presented with TB, while 19% had features of lower respiratory infection. 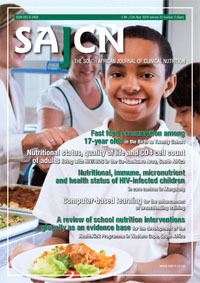 Conclusion: A high prevalence of chronic malnutrition and micronutrient deficiencies occurred among HIV-infected children residing in food secure care centres. The study highlights the importance of antiretroviral therapy and nutrition intervention in improving the management and prognosis of these children.